MONROE, La., June 20, 2018 /PRNewswire/ -- CenturyLink, Inc. (NYSE: CTL) today announced it was awarded a contract through the Houston-Galveston Area Council (H-GAC) for 911 equipment and emergency call management solutions. State agencies, local governments and qualifying not-for-profit groups can now procure CenturyLink's next generation 911 (NG9-1-1) core call routing services, on-premises call handling applications, data management and managed security services through this contract, which is part of the HGACBuy Cooperative Purchasing Program. "Public safety agencies are looking to upgrade their legacy networks to support emergency requests beyond phone calls including video messages, pictures and texts, as well as gather critical geographical data from mobile phones that can be used to improve response times," said Jim Carlson, public safety solutions leader, CenturyLink. "This H-GAC contract makes it simple for participating government groups to utilize CenturyLink to upgrade critical emergency services." 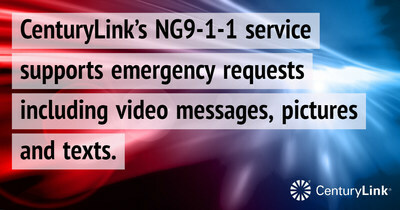 CenturyLink's NG9-1-1 service is comprised of Emergency Services IP networks (ESInets), IP-based software services and applications, and databases and data management processes that are interconnected to public safety answering point premise equipment. NG9-1-1 provides standardized interfaces for call and message services, processes all types of emergency calls including non-voice (multi-media) messages, and acquires and integrates additional geographical data useful to call routing and handling for appropriate emergency entities. HGACBuy is a government-to-government procurement service for state agencies, counties, municipalities, special districts and qualifying non-profit corporations. This contract covers emergency notification-related equipment, software and services that encompass dispatch and emergency call control.